allegheny.edu / About Allegheny College / History / Allegheny Presidents / Timothy Alden Jr.
Allegheny College took its beginning in the dreams and education of a lonely school boy who became a zealous scholar and later an itinerant preacher and teacher. His hopes, convictions, strengths, and weaknesses shaped the institution he created in 1815. 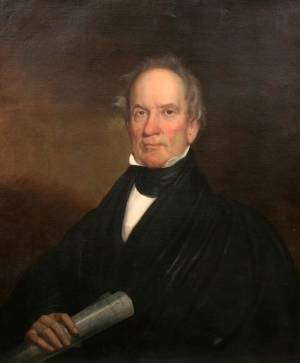 The Reverend Timothy Alden Jr. was the first president of Alleghany College (as the name was then spelled) and professor of oriental languag­es, ecclesiastical history, and theology until 1831; librarian until 1832; and trustee until his death on July 5, 1839. Born August 28, 1771, to a ministe­rial family in Yarmouth, Massachusetts, the direct descendant of John Alden of Plymouth Colony escaped early assignment to the drudgery of a farming life. Alden’s uncle, on whose land he labored, supported his desire for education. It was he who led Alden to an appreciation of history, specifically regarding his separatist Pilgrim forebears of Leyden in the Netherlands and of William Bradford’s Plymouth Plantation. Alden worked his way through Harvard University in Cambridge, Massachusetts, waiting tables and teaching in local schools. Oriental languages became his focus; he gave his senior oration in Syriac. By the time he grad­uated Phi Beta Kappa in 1794, Alden was proficient in eleven languages besides English. He subsequently earned a master’s degree while teaching in Marble­head, Massachusetts; the subject of his advanced studies was theology. Scholarship, he believed, informed and strengthened faith. In his mind, no conflict existed between science and belief. In Marblehead, Alden married Elizabeth Shepherd Worm­sted, the daughter of his landlady. “Betsy,” he called her, and she would bear him two sons and three daughters in addition to a set of stillborn twins. Although Timothy considered teaching to be a sublime and important profession, he soon yearned to become a minister. It was a natural step in that it enabled him to teach a wider audience than grammar school students and also directly to serve God. A Trinitarian Con­gre­gation­alist, in 1799 Alden was ordained as an associate pastor in the South Parish of Ports­mouth, New Hampshire. Desire for higher pay to support his growing family brought separa­tion from his post in 1805. He re­mained in Ports­mouth as a teacher and magazine editor until moving to Boston to open a school in 1808. Two years later he accepted appoint­ment as principal of Newark Ladies Academy in New Jersey. There he joined the Pres­by­terian Church. Throughout this period he published short articles and a five volume Collection of American Epitaphs that won him recognition as an anti­quari­an. While living in “New Ark,” as Alden termed the town in his correspondence, the Aldens learned about the western frontier. He determined to be active in the West, founding a town and then a college. His goal was to serve God by serving Man, and to service his young county by strengthening its unity through inculcation of a community of ethics and morality through the education of ministers, teachers and others in the newly settled regions. After a few months in New York City, Alden brought his family to Meadville, PA, arriving on April 24, 1815. Local citizens, eager to develop their frontier town, persuaded him to establish his col­lege there. Only in 1828 would he initiate a village, called Alden­ia, on the west shore of Con­neaut Lake. In addition to founding the College, teaching many of its first students, forming its library, and shaping the erection of its great building, Bentley Hall, Alden undertook five missionary trips among the Seneca Indians in their reservation at the headwaters of the Allegheny River. He played a key role in the creation of the Meadville Bible Society and was the founder of numerous Memoriter Bible societies. Designated county patron for the American Sunday School Union, Alden started close to eighty Sunday schools in the region and amassed a sizeable library for the Crawford County Sunday School Union. A Free Mason, he helped to found the Western Star Lodge of Meadville, the first in the area. He also served as regional counselor of the American Antiquarian Society created by his friend Isaiah Thomas and as an officer of the local chapter of the American Society for Colonizing Free People of Color. On several occasions he acted as regional delegate to the General Assembly of the Presbyterian Church. Receiving little or no wages for his college duties, Alden barely managed to support his family through frequent preaching at local churches and by land speculation. He prevented Harm Jan Huidekoper—agent for the Holland Land Company, a group of Dutch investors that controlled a vast portion of the region—­from influencing the congregation of the Community Brick Church to Unitarianism, which Alden opposed, and caused a rift with the land agent that endangered the financial future of the College. Because of low enrollment in the College, scanty legislative funding, and lack of support from the Presbyterian Church, Alden came to believe he had done all that he could in a mission to which he had devoted seventeen prime years of his life. The College closed in 1831 for lack of funds (it would reopen in 1833). Alden wished to return to preaching in New England, but no opportunities arose. Instead, on June 2, 1832, he and his family moved to Cincinnati, Ohio. Elizabeth had died on April 3, 1820. Two years later Alden married Sophia Louisa L. Mulcock of Reading, Pennsylvania, eighteen years his junior, with whom he had one daughter. The two opened a school in the Queen City, but a cholera epidemic caused them to withdraw to Pittsburgh. Alden started another school but soon accepted the post of principal at East Liberty Academy. Sale of his lands along Conneaut Lake quickly provided sufficient income to allow him to pursue the activity he truly desired: the ministry. He preached to small congregations, first at Yellow Creek in Madison Township and then at Pine Creek Church near Sharpsburg. Alden died unexpectedly after a month’s illness at the home of his daughter Martha in Pittsburgh and was buried in the Pine Creek churchyard. In 1908 his remains and those of his first wife were relocated to the College’s plot at Greendale Cemetery in Mead­ville. Though wearied by multiple disappointments and anxious for the future of his family, Alden, throughout his life, was sustained by an unflinching and vibrant faith. In the end he achieved an unlikely success: the establishment of an institution of classical higher learning in the western wilderness.